A Pope and Two Cardinals – creating characters at a glance! Of all portraits of popes that fascinate me, one stands out above all others. Shudder at the sheer power and frustration of Titian’s gnarled Farnese Paul Iii , and the fear of the cardinals around him, now in the museum in Naples. He was the pope who ordered the ageing Michelangelo to paint the Last Judgement on the end wall of the Sistine chapel. Pause at the later Innocent X by Velasquez, alone in his own room in the family palazzo in Rome – now the Doria Pamphili gallery. Earlier still than these is Raphael’s portrait of the first Medici pope. Giovanni de’ Medici was the middle of Lorenzo de’ Medici’s three sons following their tutor at the bottom of the fresco. 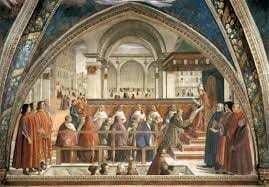 He’s the fair-haired one looking out from Ghirlandaio’s late fifteenth century fresco in the Sassetti chapel to the right of the main altar in the Florentine church of the Santissima Trinita’. Lorenzo, who was the first of the Medici not to marry into another Florentine mercantile family, considered Giovanni to be his brightest son. With the help of his wife, Clarice Orsini, from one of the oldest Roman papal families, Giovanni was became a cardinal aged 13. All did not go smoothly. In a dispute with Pope Sixtus IV and the powerful Florentine Pazzi family concerning alum mines and the appointment of a bishop, an attempt was made to assassinate Lorenzo de’ Medici, by then known as ‘il magnifico’. The original idea was to kill him when he attended an important dinner. This failed because Lorenzo was indisposed that evening and did not attend the event. Instead, when the assassins attacked Lorenzo in Florence cathedral, he fled to the nearby sacristy, and his brother Giulio was killed instead. Lorenzo brought up, his brother’s illegitimate son, Giuliano, with his own family. He too became a cardinal after his cousin Giovanni. Twenty years later, aged 36, Giovanni became Pope Leo X – the Medici had become a papal family. Unconcerned by what Luther was saying and writing, Pope Leo X pursued his antiquarian interests and patronised the arts, in particular Raphael who had already begun the Vatican apartments called the Stanze.. Walk slowly towards Raphael’s 1617 portrait in the Uffizi Gallery, Florence, and three gazes cross the space between you and the painting. Seated sideways is the rather plump pope, his elegant hand holding a gold-framed magnifying glass. The 14th-century illuminated a manuscript in front of him has been identified as one now preserved in Naples. By the manuscript is a silver and gold bell for him to summon attention. The pope is looking off left – deep in thought, or at someone approaching? 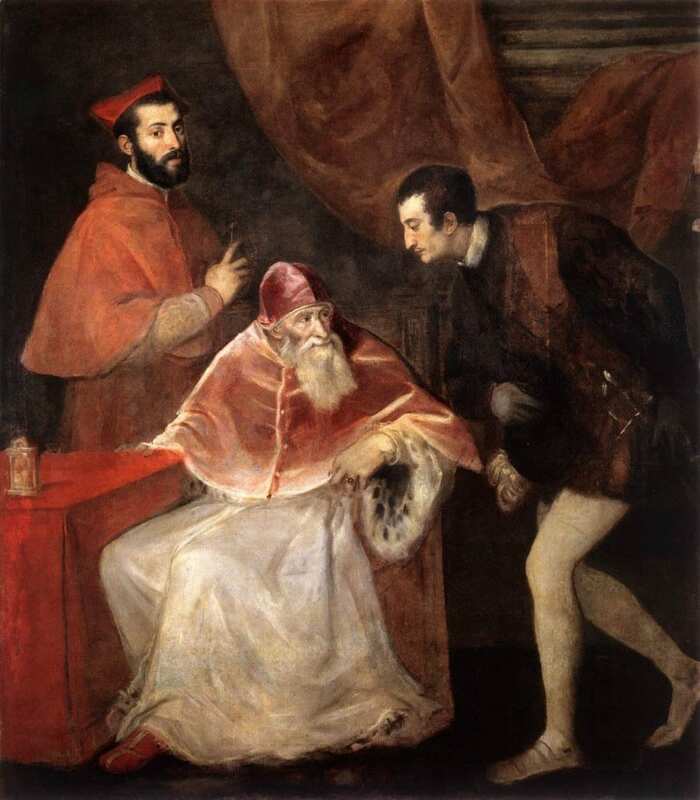 His cousin Giulio, the Medici cardinal on the left, is looking down at his cousin, while Cardinal Luigi de’ Rossi on the right stands, hands grasping the papal chair, and looks out to his left. No one looks directly at us. Is the pope almost scowling? Has he seen something disturbing? Is his cousin about to raise his eyebrows and ask a favour? Luigi is looking at the source of light catching faces, hands and the pope’s damask sleeve. Is a door opening? Something ominous happening? He looks concerned. The polished sphere on the pope’s chair contains a distorted reflection of the room and a window providing the source of light. Some see the painter’s reflection there. The reds are ins slightly different shades adding to the atmosphere of tension, irresolution and even a potential drama we are witnessing. A great, unforgettable and disturbing portrait.